Sonny Landreth makes the six strings on his guitar sound like an angel singing over her cocktail at last call. There’s enough swampy swagger going on to summon up bayou mojo every time the Louisiana-based slide guitarist plays, no matter the venue. Night after night Landreth boogies through live sets that are drenched in the blues interlaced with zydeco grooves, infused with Cajun spirits and blasting with the intensity of a rock ‘n’ roll power trio. 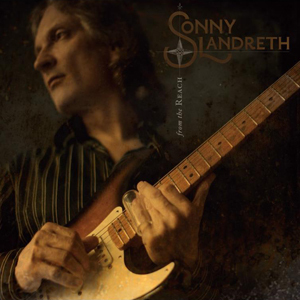 The slide, with its tendency to make your standard guitarist sound like he’s just hoping to land a right note, is a tool that Landreth works with precision. He’s got grit in his playing, as if he were using a real bottle neck and the notes are crisp, soaring out of the guitar and over the edge of the stage. All this is done while Landreth watches his instrument intently, without showboating or ostentatious antics. Think of him as a Cajun version of Duane Allman. 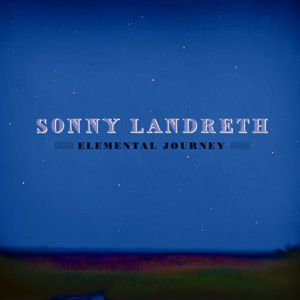 Landreth was born February 1, 1951, in Canton, Mississippi, and his family lived in Jackson, for a few years before settling in Lafayette, Louisiana. His earliest inspiration came from Scotty Moore, the guitarist from Elvis Presley’s band but as time went on, he learned from the recordings of musicians and groups like Chet Atkins and The Ventures. As a teen, Landreth began playing out with his friends in their parents’ houses. For the past 35 years, Landreth has been on a cross-country musical journey with layover stops in taverns, concert halls and festival stages everywhere from Maine to California. For the bulk of that time, Landreth has used the same musicians in his trio. “The bass player, David Ranson, and I go way, way back, and with Mike Birch on drums, I think we got something unique that works out really well as a trio,” he says. Three seems to be enough. Landreth fingerpicks and slides, creating as much sound as a full rhythm section all by himself. And with a couple longtime friends backing him, Landreth can explore the depths of the instrument’s possibilities while in his comfort zone. With New Orleans not too far away from his home in Lafayette, Louisiana, Landreth was able to hear other music that would influence his playing – jazz cats like Miles Davis, Charles Mingus, and Duke Ellington. “My jazz heroes had much the same goal: to emulate the human voice with their instrument. And I just think the slide guitar lends itself to that,” he says. 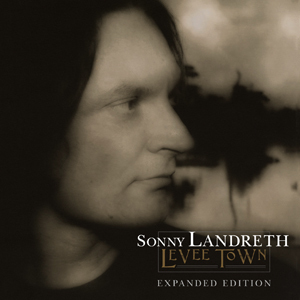 Sonny Landreth’s 2000 release ‘Levee Town,’ was reissued in 2009. The album was a tale of life in Louisiana, mixing music, myth and mojo to conjure up music that rocks hard and runs deep. The re-mastered reissue contained five previously unreleased tracks from the original sessions and a co-write with Will Jennings, ‘For Who We Are (The Nightbird Sings),’ with guest Jennifer Warnes. The album also featured guests, Bonnie Raitt, John Hiatt and BeauSoleil’s Michael Doucet. - Acknowledgement to Brendan Giusti.